The interview began with Koolhaas being told a profile of him had just appeared on the front page of that week's New York Observer. A brief discussion of the quality of the article ensued, after which Koolhaas added . . .
Rem Koolhaas: It's horrible to be on any front page. You have no concept of how horrendous all of that that feels, but anyway . . .
You've written in the Mies in America about how you love Mies. What is it in his work that inspires this love? Rem Koolhaas: . . . Ironically, I don't really know. I think it's not necessarily something of similarity or affinity. It's definitely not something about similarity, but maybe Mies is the largest possible opposite, and therefore the most attractive. Apart from that, there is simply an aesthetic and deep liking for disappearance kind of rather than minimalism. In the IIT Tribune McCormick Campus Center, you appear to be addressing diversity much more directly in terms of the diversity of the materials, the diversity of textures within your own building. Rem Koolhaas: Well, I don't think it's really a diversity of materials, because the real material is obviously glass and sheetrock, but sheetrock comes in all kinds of versions, so its I would say that is also why it's important to have these vast expanses of exposed sheetrock because this in a way is a kind of return of Miesian Puritanism about steel, but a more abject material. What about the emphasis on graphics and iconography? Why has this become so important now as opposed to the more elemental architecture of the past? Rem Koolhaas: I think that is kind of in a way a response to globalization, I think when IIT opened, you could probably assume that everyone would feel very welcome in a highly abstract space such as Crown Hall, and would have situations with being well treated, I think that if the current generation enters a building like that, I think that is highly dubious. They would kind of feel a weird absence of information. I think that also that given the fact that the student body is now literally from at least four or five continents, it felt very important to try to develop a language of fundamental information that is effective in those circumstances. It's also definitely not something we are doing to the same effect in our other buildings. I think it's really for this explicit purpose and this explicit program, and this explicit condition. Is the use of color also very specific to this building? It seems like orange is the keynote color, and green is its complement. Rem Koolhaas: I think that one of my fascinations with Mies is his sense of color, even though at first he is not usually associated with color, but I think that in the 20's and 30's he did some really strong experiments with color, and I can also kind of remember the first time I was in the Chicago Arts Club that there is kind of really strident and outrageous sense of color. I didn't necessarily want to make it strident or outrageous, but I think that also interestingly enough, at least that was the effect on me when I was standing on State Street, the building (Student Center) in its scale is very modest compared to the Mies building, but by being that color somehow brings out the color in the Mies building, also. By contrast between the two? Rem Koolhaas: Not only by contrast but also by raising the issue of color, you suddenly see much more color in Mies. The Campus Center is a one story building, but it was a wide variety of levels. Is that the concept that people just expect more now, they don't want to see things just on one plane? For me, it has that kind of beauty of potential focused on the concept and liberation from technique in a certain way, and as part of the repertoire of a single story building, I think that relatively modest sectional variations add . . . a kind of simple but efficient effect. That is the kind of metaphor of modesty vis-à-vis Mies, the building is cracked by the tube and so where it is cracked that kind of compression can be exploited, and makes, in a way, those sectional elements inevitable because they're in areas where otherwise you couldn't pass. Is it your feeling now that it's really not possible to do good work any longer in the United States? Rem Koolhaas: That's complete nonsense. First of all we're working in the United States, and IIT is one example, but also we're also doing a library in Seattle, and actually if you get a chance you really should go there, because it's really astonishing. Basically, as you know, an architect isn't going to decide where he works, but we had a phenomenally strong project for LATMA that went into the garbage dump and a phenomenally strong project for the Whitney that went into the garbage dump, and so we wanted to desperately participate in a project for the United Nations, but we were not invited. It doesn't really look as if currently there's a kind of great . . . but it's also kind of a fragility of cultural institutions in a country where culture is financed by gifts rather than by subsidies . . . and as you know, we also have an office in New York that is open for business. Does this mean that you're still going to contend for work in the United States? Let me ask you about your quote about the need to "accept the world in all it's sloppiness and somehow make that into a culture." Does this still reflect your current thinking? Rem Koolhaas: Well, yes and no. Of course, behind every project we do there is a kind of vast critical apparatus of doing better. We're not trying to emulate the current mess. We are just as interested in the sublime. Actually, that is why I'm talking about the other buildings we are doing, because they are really exceptionally ambitious in terms of not emulating confusion or something, but ambitious as architectural works in and of themselves. on architecture and capitalism . 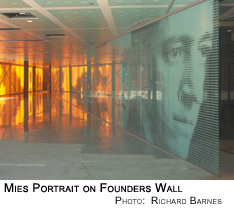 . .
Rem Koolhaas: I think what Mies tried to do is find a way to make the sublime compatible with capitalism . . . extract from capitalism the kind of elements that are sublime. . . . I think that the first real engagement with the aesthetics of capitalism is a kind of transcending it. I think that after that, perhaps (Robert) Venturi and (Denise) Scott Brown were the second wave of looking at capitalism, perhaps with a greater sense of realism. The presence of capitalism and the results of capitalism were much more blatantly present, making it clear that you could almost not transcend it anymore, and you needed to find some accommodation with its aesthetics. And I think that if you place Mies in the late 40's or early 50's, and if you place the beginning of the Venturi's thing in the late 60's or early 70's, then 20 years later of course globalization and the market euphoria become even more unfettered, and that is why I had to begin to look, with the Harvard project, at shopping, because I think that at that point almost all architectural production had contracted and focused on this one program, which in itself had morphed in such a way that it now included everything, all components. So for me, it was very important to address that, and also to see whether those demands had actually fundamentally changed the kind of spaces that we produce and the spaces that we need. So you could say that the Venturi's are in the middle in terms of having a kind of positive relationship with the iconography of capitalism. Mies in a way stood above it, and Junkspace was a more internal look, when the positive attitude of the Venturi's was no longer tenable and where we had to admit and realize it was actually a much more ominous development. So, in a way, Junkspace is a theory, and what for me is very important about this building (the IIT Student Center) is that it tried to really work not so much within the same vocabulary but see what an architect could still do within that syndrome or within that regime. You're so good at defining the reality of the world - the good things and the horrible things - that sometimes when I read your writings, it's very hard for me to see what you actually think about the things you're describing. Rem Koolhaas: There are so many opinions in architecture. I think in the beginning it was just kind of exciting to describe and not to give so many opinions. If you read them (Koolhaas's writings), you also feel that you are in the presence of a very critical mind, or at least I hope so. Certainly in the case of Junkspace I think that should be overwhelming. But at the same time, I don't want to simplify things and say I'm against them when they have a degree of inevitability, but I would say our buildings are more and more able to really disconnect from those realities, or try to make the best out of them. Is there anything I'm missing in discussing the Campus Center? Rem Koolhaas: I think it's essentially very important that you don't check with the architect. I hope that you talk about what I'm missing. © Copyright 2003-2004 Lynn Becker All rights reserved.